Creating a modern, weatherproof warehouse was the focus for the construction of a new state-of-the-art Dominos Pizza supply chain centre in Warrington. The building is located in Omega South, part of the new Omega development, a former RAF airbase site covering 575 acres situated to the north of Warrington, halfway between Liverpool and Manchester. A regeneration project owned by the Homes and Communities Agency (HCA), Omega is a £1 billion mixed-use development set in a highly accessible location just off the M62. Comprising commercial premises, new homes, retail and leisure opportunities, as well as vibrant parkland and wildlife areas, the vision for Omega involves the creation of up to 24,000 new jobs, the provision of affordable housing, and attracting long-term investment to Warrington. The new £30 million Dominos Pizza supply chain centre occupies a bespoke warehouse unit at Omega covering 10,800 square metres. Providing jobs for 120 people in the local area, the centre is used as a space for production, storage and distribution, serving 450 Dominos outlets across the north west of England, and comprises a two-storey office, parking and a substation. The development of the centre was led by architects Chetwood Associates which specified Euroclad to provide cladding for this project. Having worked with Euroclad before, the team could be confident that cladding work carried out on the building would be compliant with its requirements. 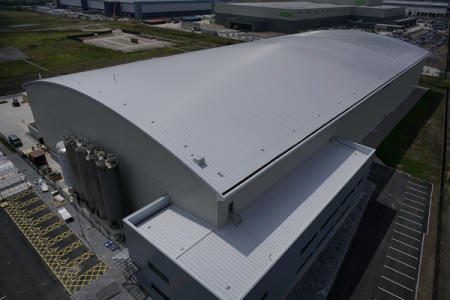 The client, Omega Warrington Limited, wanted a high quality, watertight roofing system to span the entire roof and, as one of the only cladding manufacturers that could offer continuous roof profile sheets with no joints, Euroclad was also specified to provide cladding for the roof which was over 64 metres long. Euroclad supplied its Elite 3 roofing system, which is installed without fixings and has single length rolled sheets, ideal for long-span buildings. Elite systems also offer the benefits of a package of components that form performance-tested and accredited systems that are lightweight and can be installed quickly. To eradicate the risk of water ingress, Euroclad supplied 9300m2 of continuous sheets of SF500 outer profile in Colorcoat HPS200 Ultra® pre-finished steel in Albatross, which was rolled on-site to avoid the costly transportation of large sheets. With Euroclad’s Elite system in place, the roof has an energy-efficient U-value of 0.23W/m2K. To make the most of natural light in the building, Hambleside Danelaw’s Zenon Arc barrel vault rooflights were installed in the roof making this the first building in the UK to receive these rooflights. Made using Zenon Pro traditionally reinforced glass fibre sheets, which are highly durable and can be expected to last up to 25 years, the translucent in-plane roof lights were installed as triple skin with a daylight opening width of one metre to let high levels of natural daylight into the building. Amanda Davis, Regional Sales Manager at Hambleside Danelaw, said: “Our Zenon Arc rooflights are great for industrial buildings and the ideal solution for low-pitch curved roof applications so they were the perfect choice for this project. Euroclad was also chosen to clad the external walls of the building, supplying its high quality horizontal Elite 55 system. Euroclad’s Elite wall systems offer high performance, design and flexibility to suit many applications, combined with an entire system guarantee. Selected by the client for its aesthetic appeal, the Elite 55 system is a proven, cost-effective system. 6500m2 of horizontal 32/1000 outer wall profiles were used as part of Elite 55, made from Colorcoat HPS200 Ultra® pre-finished steel in Goosewing Grey, giving the walls a U-value of 0.31W/m2K.